The time between the Great War and World War II was a time of many social changes. People, traumatised by the horror of war, were trying to establish a new order. 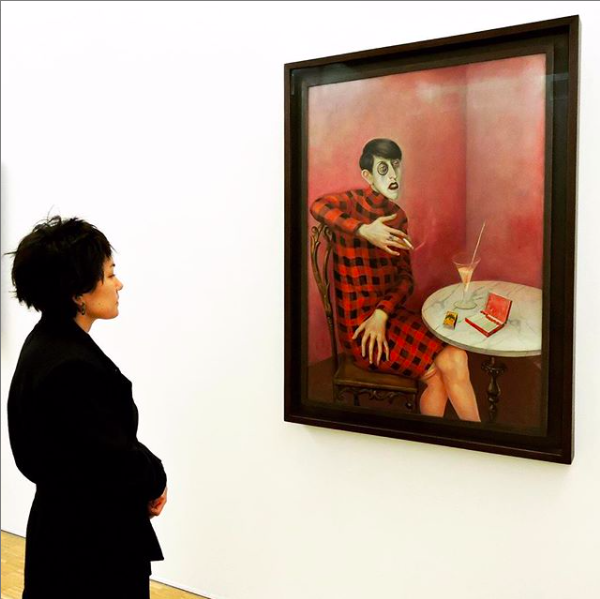 The art of Otto Dix (1891-1969) reflects this social climate– a leading German painter of Neue Sachlichkeit (New Objectivity), most famous for his harsh, unsentimental and almost naturalistic depictions of the World War I in which he participated. Sadly, in 1933 his anti-war attitudes led him to the removal from the Dresden Academy, where he worked as a professor, as his artwork was not in line with the Nazi ideology and their militant spirit. However, Dix was also a portraitist. Perhaps, his most famous portrait is that of Sylvia von Harden – although the name of this painting suggests she was a journalist, in fact, she primarily worked as a poet. Supposedly, Dix saw her on the street and said, ‘I must paint you! I simply must!’ Sylvia was, in Dix’s eyes, the embodiment of ‘their era’, she was a Neue Frau (a New Woman). Let’s unpack what we can see. A woman is sitting in a café by a table for one in Berlin 1926, drinking a cocktail and smokes a cigarette. A wedding ring is nowhere to be found on her large, masculine hands. She does not have a family, no domestic obligations, and she can enjoy herself on her own in a café of Berlin’s avant-garde jet set. She represents the public’s fear of an emancipated woman who not only works and goes out but is also highly androgynous in her appearance. Although von Harden is wearing a dress – an attribute of femininity – it is one that hides her, presumably, womanly figure. If we look down at her legs, stockings are hanging loosely suggestive of her nonchalant attitude towards a stereotypical perfectionism of a well-dressed woman. It is important to notice the way in which Dix placed her hands – one on the area of her breasts, the other on her pelvic area. The symbols of womanhood are hidden by unrealistically big hands, almost as if Dix was trying to tell us that this woman takes her matters into her own hands. Her figure contrasts with the chair on which she seats. A non-living object seems to be more curvy and delicate than the woman sitting on it. Looking up at Harden’s face we can easily tell that despite her red lipstick, she is still very masculine. There is a monocle resting on her eye – an item characteristic of 1920s dandies, yet, it is Sylvia von Harden, not a man, is its proud owner. Perhaps it symbolises a different, modern perspective a ‘Neue Frau’ might have. After all, her outlook on the world is not that distant from the viewpoint of a man. For Dix it was ugliness, not beauty, that was at the centre of his paintings and the inspiration for them. Although von Harden’s features have been caricatured, she was, in fact, very masculine – she had the same haircut, and the dress was based on her. She loved the painting and even posed for a photo next to it in the 1960s. Dix and von Harden were challenging gender stereotypes in the 1920s. Their non-conformism in life as in their art was both controversial and inspirational and even to this day, it is hard to stay indifferent seeing the Portrait of the Journalist Sylvia von Harden.